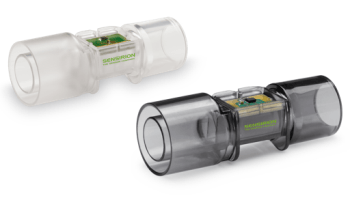 The SFM3300 mass flow meter from Sensirion is a sensor for proximal flow measurement in respiratory applications such as anesthesia or ventilation. There are two models available: The SFM3300-D is single-use and the SFM3300-AW is autoclavable and washable. The SFM3300 offers exceptional measuring accuracy and robustness coupled with a short signal processing time. The digital flow sensor computes bidirectional flow volumes of up to 250 SLM and is totally calibrated for N2, air, and O2 gases. The flow channel’s exclusive design results in a low dead space volume and the marginally greater pressure drop guarantees additional stability compared to variable inlet conditions. The sensor also comprises of medical cones for pneumatic connection to the respiratory cycle and features a mechanical interface for easy electrical connection. On account of its performance features, the SFM3300 mass flow meter is perfectly suited for single-use proximal flow measurements in hospital applications, emergency situations, residential care applications, and medical ventilation. Similar to all Sensirion sensors, the SFM3300 is founded on the ground-breaking CMOSens® Technology, which integrates the sensor element and processing electronics on a single, minute CMOS microchip. 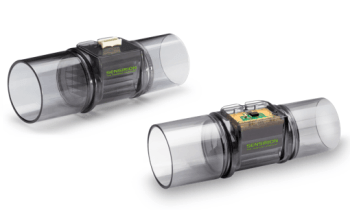 The CMOSens® mass flow sensor delivers durably stable and interference-free measurement and allows extremely fast and very precise sensor signal.